As a comic book character, Hellboy has managed to endure for over twenty-five years. His stories have even spawned their own mini comic book universe. Guillermo del Toro’s seminal Hellboy films helped contributed to Hellboy’s lasting popularity. But Mike Mignola’s art and stories have created a legacy all of their own. 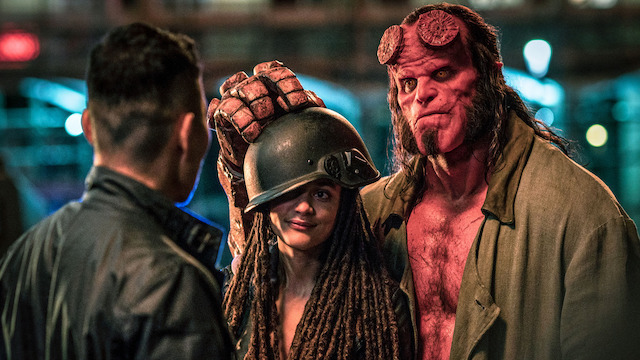 While the 2019 Hellboy reboot promised to be more “authentic” to the source material, it’s nearly impossible not to compare it to the del Toro films. Unfortunately, it doesn’t look good by comparison. This is more of a horror film with slight fantasy touches, while del Toro’s movies were rooted in fantasy with some horror. Del Toro never got a chance to finish his trilogy, and some fans are understandably still upset about that. The new film could have won everyone over if it had been executed well. But it utterly fails on multiple levels. As the new director, Neil Marshall seemed like a fitting choice for Hellboy. That’s why it’s so disappointing that the film’s direction is both incoherent and inept. It’s simultaneously trying to be dark and grotesque while also a fun take on the material. These odd tonal shifts – even within the same scene – give the film an uneven sense of identity. Marshall added a few stylistic flourishes throughout, but his scattershot direction doesn’t give the film a coherent story. 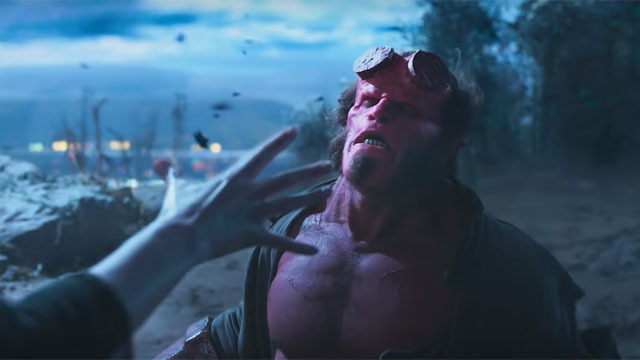 Even though David Harbour was a solid choice for Hellboy, the film never gives him a chance to really deliver a memorable performance. Harbour captures Hellboy’s pathos fairly well, but his moments of comedic levity largely land with a thud. Ian McShane’s Professor Bruttenholm, Sasha Lane’s Alice Monaghan, and Daniel Dae Kim’s Ben Daimio are all pretty much wasted. 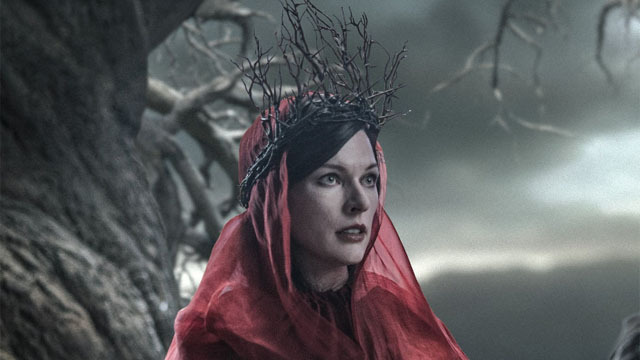 Two of the supporting players managed to seal the show: Thomas Hayden Church and Milla Jovovich. Both performers managed to be self aware enough to be interesting. However, the problem is that they are both from a different, slightly campier and over-the-top version of this movie than the one onscreen. It feels like everyone else in the cast is in a completely different film. Andrew Cosby’s screenplay doesn’t do the film any favors. It’s hard to tell if the subpar writing was made worse by the editing or vice versa. Regardless, there’s no real dramatic structure to be found, let alone character arcs or anything resembling a unifying theme. The bland writing is also filled with plot contrivances, especially with the villainous characters. For a movie with world ending plot consequences, the stakes are virtually nonexistent. The opening narration was haphazardly inserted into the prologue sequence, which was just awkward. The script also features characters constantly spouting on-the-nose dialogue and exposition. It even feels the need to retell the origin of Hellboy. That origin is essential to the relationship between Professor Bruttenholm and Hellboy. Yet the film never fleshes out their father/son bond in a substantial way. Without more to work with, Hellboy’s inner journey just doesn’t feel earned. This movie showcases a complete lack of understanding about the basic dramatic principles of a good story. For example, it literally breaks the rule of Chekhov’s Gun in the second act. And that’s not the only unsatisfying piece of storytelling in the film. Did It Really Need To Be R-Rated? 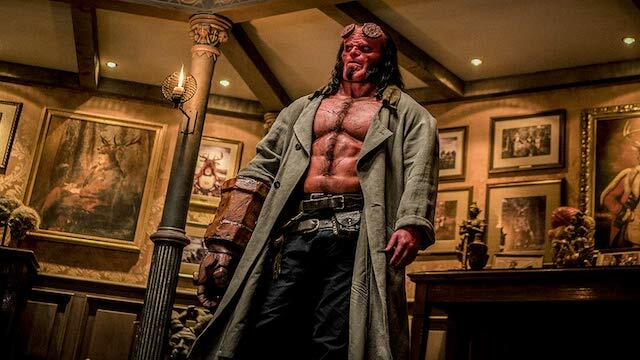 One of the selling points of the new Hellboy was the fact that it is a hard-R interpretation of the material. In theory, the extra gore and incessant f-bombs would be closer to the source material, thus giving the film a harder edge. However, the extreme violence and language only make the film seem bland. There are some excellent practical effects in the movie, and Harbour’s makeup is especially good. The computer generated effects aren’t nearly as impressive. When the movie skips to CGI creatures, there’s never a moment where any of the monsters feel tangible or real. The editing is an absolute travesty. It’s hard to tell if this movie’s problems are a result of the writing or the post production. The film plays like a rushed and haphazard producer-infused edit. Perhaps Hellboy is a victim of having too many cooks in the kitchen. The film is mired with weak scene transitions and directionless storytelling throughout. Add in underdeveloped subplots like the Blood Queen’s rise to power, and you have a recipe for disaster. There are some really great body horror moments in the movie, especially during the nightmarish Baba Yaga sequence. Regardless, the grotesque design choices are befallen by the overabundance of digital effects work in post production. While there’s a healthy dose of violence and gore, the lack of practical blood is often a noticeable shortcoming in a film filled with much larger problems. 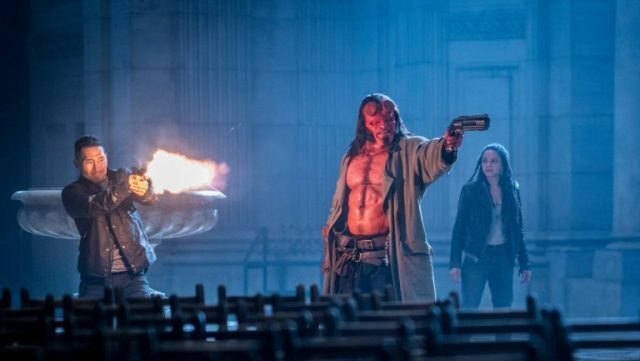 For better or worse, the Hellboy reboot is the type of movie that you’re either going to love or hate within the first ten minutes. Overall, the movie is a pretty big disappointment. It failed to deliver a film that was worthy of rebooting the franchise to begin with. It may have had the potential to be a good Hellboy story. Yet it doesn’t justify its existence or capture the elements that made the comic so endearing. Ultimately this begs the question: what was the point of rebooting this franchise in the first place?